A visor is a useful and well priced promotional item to get your brand exposed at large sports stadiums, golf days and other outdoor occasions. Brand them with your corporate logo and offer them to visitors when they arrive. You will create fabulous marketing opportunities when your logo is seen on heads all around the venue. 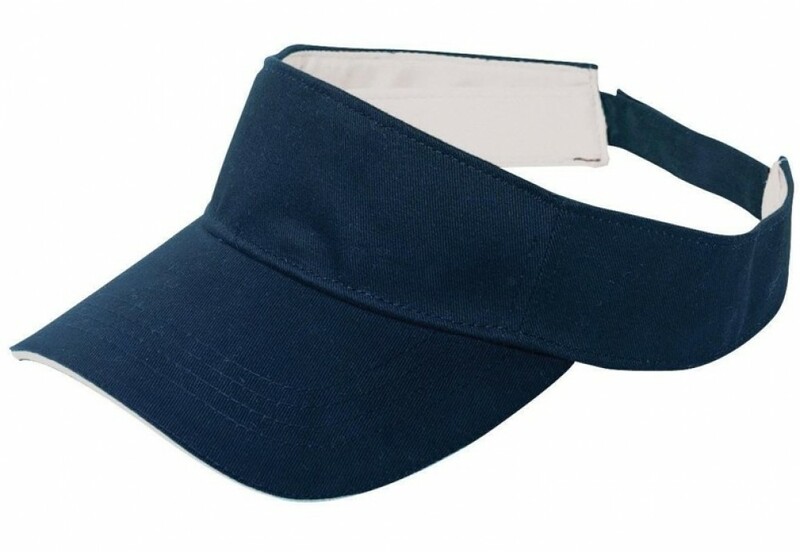 The visors are made from a lightly brushed cotton twill that is easily washable and long lasting. A cool hand wash or a lukewarm machine cycle keeps them looking as good as new and the colour will never fade. The visors are made to the highest standards are quality control is monitored throughout the manufacturing process. We offer a choice of a navy and white or an all-white option, ideal for showcasing your image. The visor fits neatly over the forehead, closes at the back with an adjustable Velcro closure and protects the face from sun by means of the pre-curved peak. For added comfort, a cotton sweatband is incorporated into the inner section. Our pricing includes 8k embroidery of your personalised graphic. Embroidery can be done on the peak, sides or back of the cap and embroidery can accommodate multiple colours, making your logo really stand out. A once off set up of $50 applies for orders under 50 units. Delivery of this item is within Australia only. Please note that our pricing excludes GST.